A refurbished historic and gorgeous music hall designed by Frank Matcham, with a full programme of theatre and comedy, close by Hackney Central Station. Chaplin and Stan Laurel played here, as well as Marie Lloyd and no doubt Little Tich & His Big Boots and Wilson, Keppel & Betty with their sand dance in Arab costume. 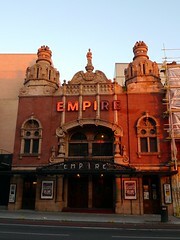 It also has a cafe called the Empire Cafe (formerly the Marie Lloyd Bar). Last visited by [dhyandeva]?, March 2007. Last edited 2011-04-05 17:36:13 (version 10; diff). List all versions. Page last edited 2011-04-05 17:36:13 (version 10).